"Say that you'll do it! Swear!" "Like, the f-word?" The latest film from Oregon-based stop-motion studio LAIKA, opens with a kitschy throwback opening sequence that perfectly sets the tone for the adventure ahead, including 70s-style studio logos and an "Our Feature Presentation" card ripped right from the grindhouse. It instantaneously alerts you to the fact that you're in good hands, and does nothing to betray that trust in the ensuing ninety minutes. In other words, I'm happy to report that a summer filled with family films lacking in imagination, goes out with a bang, as this film has imagination & inspiration to spare. Norman (Kodi Smit-McPhee) is cursed with a gift of being able to see and communicate with dead people. He sees them everywhere, including the ghost of his beloved Grandma (Elaine Stritch). Unlike another famous character with the same gift, however, Norman doesn't view this as a curse; It's everyone else that treats him differently. His parents (Jeff Garlin & Leslie Mann) don't understand him, his sister (Anna Kendrick) downright despises him, and the class bully (Christopher Mintz-Plasse) dishes out nonstop punishment to the besotted boy. Fate has big plans for Norman though. There is an imminent invasion of the undead, and according to Norman's crazy uncle (John Goodman), Norman is the only one that can prevent it. When he fails to prevent it, due to circumstances beyond his control, Norman must convince the entire town that he's the only one that can set things right. 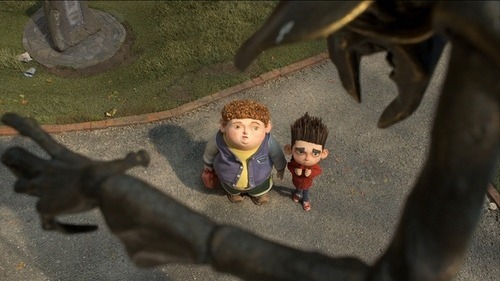 One of the things that ParaNorman does incredibly well is instill in the audience that things are not always what they seem. One of the things that I was apprehensive about regarding this film in the first place, was that it was yet another zombie movie. Zombies are all the rage right now, and every possible metaphor that they could represent seems to have been used up a dozen times over. If it's at all possible, though, I'd love to convince you that there is refreshing twist that this film has for the undead, and therefore I won't spoil it here. 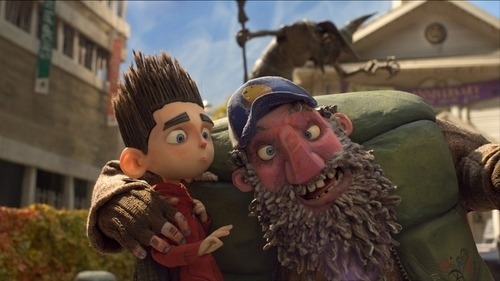 LAIKA's last film was 2009's Coraline, and that film set the bar sky high for anything else they would do in the future. 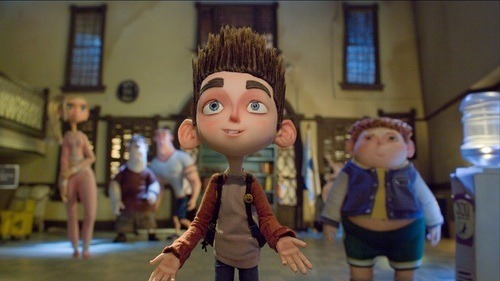 Rest assured, though, that ParaNorman is a worthy successor in quality, much the same way Pixar's A Bug's Life was to Toy Story. It's a pleasantly different story told with the same twisted sensibility. The film is very funny, appropriately dark, but still family friendly, containing a wonderful message along the lines of those who fail to remember and learn from their past being doomed to repeat it. The voice talent is solid, top to bottom, with Smit-McPhee conveying a wonderful sense of exasperation, desperation, loneliness & determination. As Norman's only friend Neil, Tucker Albrizzi is also fantastic & Casey Affleck is great as Neil's older brother. Casting an actor like Mintz-Plasse to voice a giant bully was inspired, and pays off great dividends. I still don't understand the phenomenon of casting, pardon the expression, fat actors to play fat characters, but both Garlin & Goodman are great. I guess I just don't get the sensibility behind casting directors only casting these great voice actors to play fat guys. The animation is amazing, as to be expected. Three years have passed since Coraline, and LAIKA surpasses even that film's great look. The film's climax is a wonder to behold & the way they superimpose the ghosts onto the frame is inspired and eerie. The use of 3D is minimal and mostly adds depth rather than being gimmicky, but it's a better use of the technology than, say, Brave or Ice Age made. I took my six-year old daughter Clementine with me, and she had a blast, laughing up a storm. After we left the theater, she said to me, "Dad, Norman's dad didn't believe in him. That's really sad," and that to me is an indicator of how good the film's creators were at establishing and conveying their message. What could have been a pat exercise in the standard "believe in yourself" tropes got turned on its ear. It's not surprising that this film is rooted in a story as old as the tale of Chicken Little, but it's a powerful tale that gets better in the re-telling. With Pixar and Ghibli already established animation powerhouses, and Dreamworks beginning to finally assert itself as a force to be reckoned with, I think we can safely say that we're in a bit of an animation renaissance. Let's hope that LAIKA sticks around for the long haul, because they're currently batting a thousand. Quality animated films are a win-win for studios and audiences, and now that we finally seem to be past the days of rapid-fire pop-culture references as substitutes for actual storytelling creativity, I think we can look forward to a bright future for the animated film. 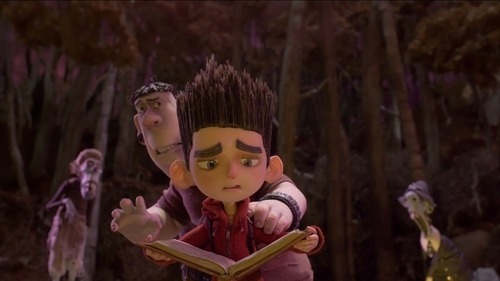 If only the next batch is half as smart as ParaNorman, we're in for a hell of a ride.